Entertaining, inspirational, earthy, and wacky, that's me. Let me bring YOUR guild an exciting program that's completely out of the box (and out of my giant suitcase)! THINK OF ME if a last minute cancellation needs to be filled! LET ME TELL YOU how to make one of my workshops work for your guild's budget! Guild Program Chair, book me now! 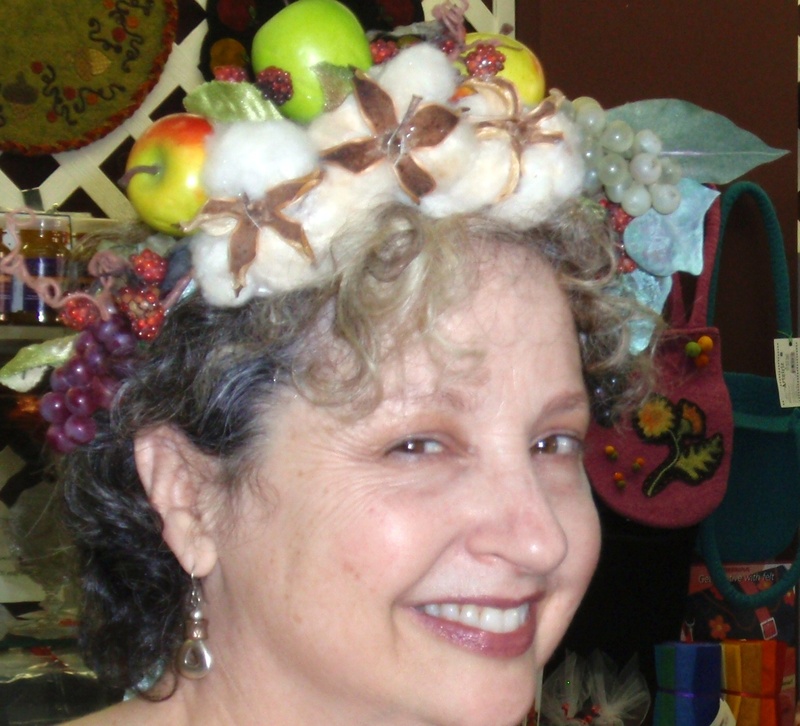 Click here for my lively programs--all with trunk shows of wonderful, touchable quilt projects, and click here for the fabulous, fun workshops I offer. HERE'S WHERE I'LL BE--All guilds welcome guests, so if you're in the vicinity, do come to a program, and contact the guild if you want to get into a workshop! 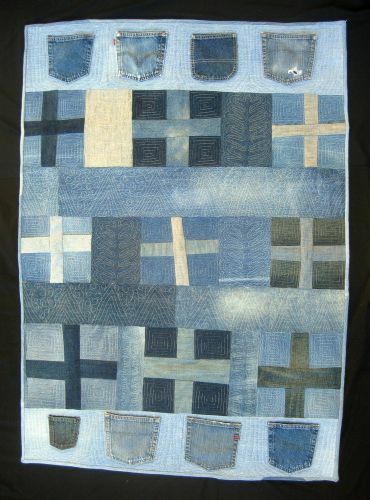 May 14, 2019: Evening Stars Quilt Guild: 7:00 p.m., program--Quilting Project Runway, Belvidere High School Cafeteria, 809 Oxford St., Belvidere NJ. 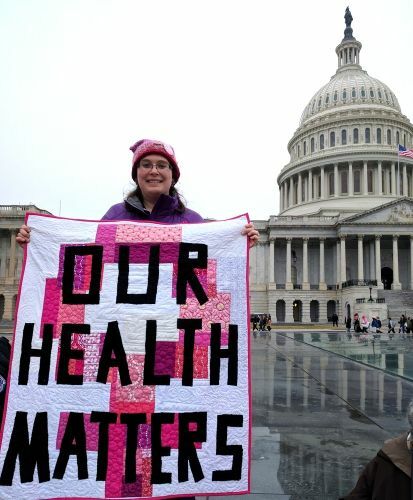 June 4, 5, and 6, 2020: Block Party Quilters of Eastside Seattle: Program, Thursday evening at 7 p.m., Mary Queen of Peace Catholic Church, 1121 228th Ave. SE, Sammamish, WA 98075: Rock Your Quilting; Workshops 10 to 4:30: Friday, Hello Baby--Personalizing Quilt Projects; Saturday, Weave a Quilt with Me. Workshop location to be determined. I LOVE BEING A PART OF THE QUILT WORLD! I enjoy the welcoming community in its entire breadth. Whether traditional quilters who want to play hooky from that heirloom project, or art quilters who want to go wild with new techniques and opportunities, beginners who want the fun of fabric play without all the rules and fastidious methods, or experienced quilters looking for something different....I applaud and support you! Would you support me? 1--GET YOUR QUILT GUILD TO BOOK ME! 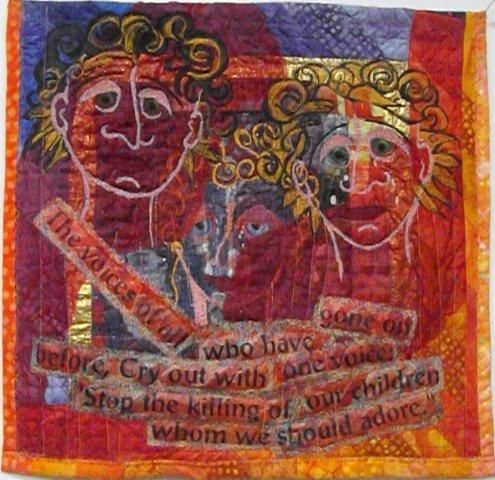 It's where the soft, evocative art of quilting meets the patriotic expressions of our core values on all the important issues of our time. Examples, below, l-r, top to bottom: Blue Cross/Blue Shield, by Cathy Perlmutter; Our Health Matters, by Jessica Skultety, Where Have All the Children Gone, by Maude Haeger. How about submitting a work of your own? Click here. Any questions? Don't hesitate to get in touch—just click on “contact me” --the last link at the top left.